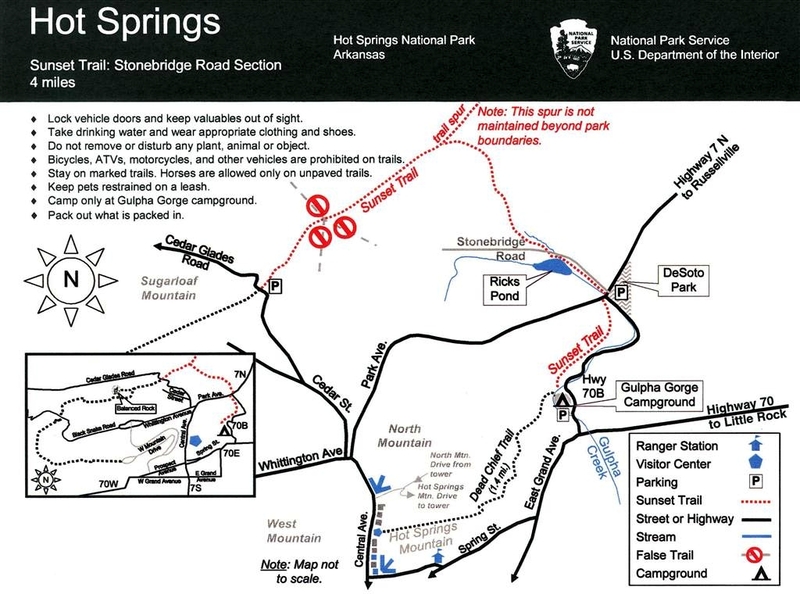 This hike started on the Sunset Trail on Sugarloaf Mountain and ended along the promenade on Hot Springs Mountain. My husband Rick and I were going to hike up Sugarloaf Mountain on the Sunset Trail (Section 2) to see the “Balanced Rock” but the trail had too many weather ruts and loose rocks for his newly healed ankle. We decided instead to head down and pick up the Sunset Trail (Section 1 aka Stonebridge Road Section) on the old Fordyce Estate at the Cedar Glades Road trail head. 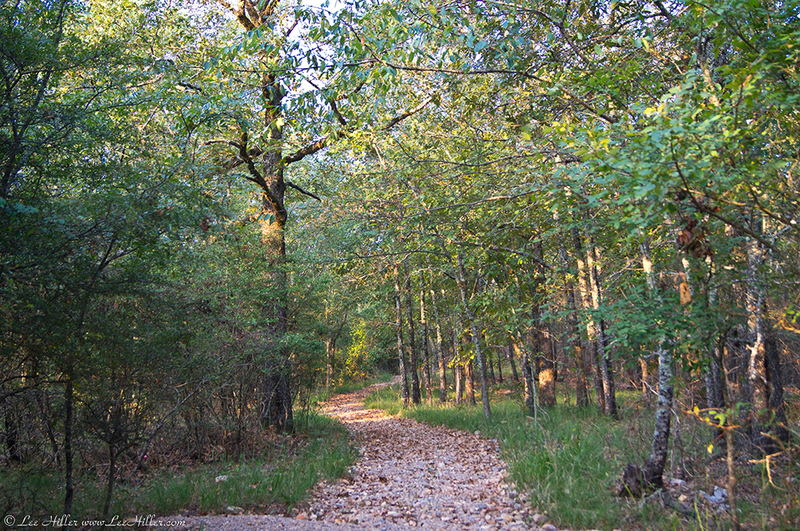 It was a beautiful hike along the trails as the early morning sun lit our way. There were wonderful wildflowers I had not seen on other trails in Hot Springs National Park, they included Slender Bush-Clover, Rough Buttonweed, Goldenrod and Drummond’s St. John’s-Wort. Rick spotted a young Male Box Turtle moving slowly across the barely groomed trail, he had a lovely colorful face. Flying Grasshoppers sprung up from the trail with each step forward, some had yellow wings others black with white edges. Although the Bird song was varied and loud they were tantalizingly out of sight high the the Forest canopy. As we finished our hike on the Sunset Trail a Sharp Shinned Hawk flew over us and toward Sugarloaf Mountain… to be continued. I adore hiking on rough trails and always mange to navigate my way to my intended destination, even when the trails are not well marked. However it may not appeal to hikers intending to complete a trail in a specified time frame to keep back tracking. If you are planning to hike section 1 of the Sunset Trail (see Map below) contact me, the trail is unmarked in many key spots. Several trails not mentioned on maps take you off the Sunset and away from the trail head that connects to section 2 of the Sunset Trail. I left an arrow marker made from sticks but that could easily be disturbed by weather and wildlife. The red circle slash markers on the official HSNP map below refer to the access road that cuts across the old Fordyce Estate not the trail forks mentioned in my blog. Please add trail markers so hikers can stay on course if they are hiking the entire Sunset Trail. It is particularly confusing below the concrete water reservoir at the 3 trail fork (not on the official map below), the one going straight leads away from the trail head, hikers need to stay left. The red circle slash markers on the map below refer to the access road that cuts across the old Fordyce Estate not the trail forks mentioned. One off the forks another leading away from the trail head has a storm ravaged abandoned homeless camp you may want to clean up as it is located in the middle of the trail. A quarter mile in from Cedar Glades Road trail head on Section one of the Sunset Trail we spotted a pack of feral dogs being lead by a large grey pitbull. Although they ran from us, you might want to get them off the trail before there is an unfortunate incident with a hiker and a leashed dog. This morning was beautiful so my husband Rick and I decided to head out early and enjoy the cooler morning temperature. As we neared North Mountain I spotted small dark blue Asiatic Dayflowers. I saw very deep blue bloom and discovered it had a third petal that was white with blue edges. A wonderful anomaly! After I finished taking my photographs I noticed a Tufted Titmouse watching me from a downed branch. We headed up North Mountain on the Floral Trail as the sun began to rise above Hot Springs Mountain. In the early morning light I saw tiny yellow St. Andrews Cross blooming on the trails edges. Further across North Mountain on the Upper Dogwood Trail a tiny Chipmunk was hopping on rocks and branches looking for breakfast. As we turn to continue hiking my husband points out the purple berries of Callicarpa (American Beautyberry Gallon Plant) glistening in the early light. Lovely teeny tiny white Flowering Spurge are glowing along the Hot Springs Mountain Trail. The delicate white flowers have a green center with yellow stamens and they are a welcome sight in the summer Forest. We stop and rest at our mountain wedding chapel on the Honeysuckle trail, it is always a place of joy. Near the bottom of the Floral Trail a pretty purple Butterfly Pea is in full bloom. As I am photographing it Rick points out a lovely little rock nestles in pine needles. A gentleman in a Hawaiian shirt passes us on the trail and we wonder if he is part of a new Jimmy Buffett hiking club (he passes us gain as we head home on Central Ave). It has been a lovely morning with my Beloved Husband Rick on the trails in Hot Springs National Park. Field Notes: The heat and humidity has returned with a vengeance to Hot Springs National Park. This morning it is 80 degrees with 80% humidity and a heat index of 85 as I head into the Forest. The hazy veil of humidity has returned and I am sweating after only a few paces out my door. Many people I pass as I head up the mountain are carrying rolled towels in an effort and keep their face and neck dry. Vibrant blue and yellow wildflowers dominate the drying green Forest. Patches of blue Asiatic Dayflowers are popping up all throughout the park. Usually I have found them in small numbers around the few open steam vents on Hot Springs Mountain. The extreme heat and humidity has provided them the perfect climate to spread out across the park. I have photographed them on the Carriage and Hot Springs Mountain Roads plus the Tufa, Peak,Floral and Hot Springs Mountain Trails. For those of you who find yourself having allergies in the summer the culprit might be the lovely daisy shaped yellow aptly named Sneezeweed. The extreme temperatures have also given them a perfect growing environment and they are more abundant on the west side of Hot Springs Mountain. Although I have not seen most of the multi-generational families of birds that once inhabited the slopes of Hot Springs Mountain, today was filled with some old winged friends. As I enter the park a tiny House Sparrow is peering at me from it’s perch on a branch at the bottom of a flowering bush. When I reach the Peak Trail I hear the familiar sound of whistling flapping wings. Only one bird take off could make this sound, in the Tree above a Mourning Dove is giving me a shy glance. When I reach the Hot Springs Mountain Road two molting Crows are perched on branches to my left. The new fuzzy head feather make their beaks appear larger. My old dancing partner looks at me in a moment of curiosity and recognition. The park Crows often travel in large family groups and I wonder how many of them survived the storm last week.